2018 Kindelsperger Forum - "The Workplace Philanthropy Evolution"
A half-century ago, the United Way came up with a simple concept that revolutionized philanthropy: It enabled employees at companies to contribute to affiliated cause groups through payroll deductions. Today, the corporate and philanthropy landscape is vastly different, as are the ways in which employees and donors engage with causes. Companies now recognize that developing a philanthropic voice is a vital strategy to compete for talent and the attention of cause-conscious consumers. What does a rapidly changing workplace philanthropy environment mean for nonprofits? Nick Bailey has been working at the intersection of technology, nonprofits, and corporate philanthropy for more than a decade. As Vice President, Innovation and Products he is focused on ushering in a new network model for corporate philanthropy and individual engagement through Salesforce.org Philanthropy Cloud. Genevieve G. Shaker, Ph.D., is associate professor of philanthropic studies in the Indiana University Lilly School of Philanthropy at IUPUI and adjunct professor of liberal arts. She was an advancement officer for 20 years, most recently as associate dean for development and external affairs for the Indiana University School of Liberal Arts, where she facilitated fundraising, communications and marketing, alumni programming, and public events. Professor Shaker's research focuses on fundraising, higher education advancement, philanthropy in the workplace, and philanthropy, public good, and faculty work. Her current projects include an exploration of the fundraising profession, studies intended to generate new information about workplace giving in the United States, and continued examination of how higher education contributes to the public good. Much of her research is intended to contribute to practice and policy as well as to build scholarly understandings. She is associate editor of the journal Philanthropy & Education. Professor Shaker brings experiential learning strategies, active learning pedagogy, and innovative curricular design to her courses. She is the co-developer and lead instructor for the "Celebrity Philanthropy" class, leads the faculty learning community for "Giving and Volunteering in America," and mentors and advises students at the undergraduate and graduate levels. On various occasions, Professor Shaker has been recognized for her excellence as a teacher and researcher as well as a practitioner and member of the university and broader community. Penny Lee joined United Way of Central Indiana in May 2013, stepping in to lead the corporate fundraising team. Since that time, she has served as the Vice President for Fundraising, and currently serves in the role of Chief Fundraising Officer. During her tenure at United Way, Penny has led transforming the fundraising team to address the challenges in corporate workplace giving, created a transformational giving effort, enhanced the major giving focus, and has adapted UWCI's approach with corporate partners from that of simply fundraising to strategic partnerships that focus on employee engagement, brand lift and attainment of CSR goals. She also guides the work of the 5 Area Offices in the UWCI footprint. Penny actively represents UWCI on two key United Way Worldwide Initiatives. The Corporate Relations Operating Group and the Select Cities Tiger Team. Prior to joining United Way, Penny served as the Vice Chancellor for Public Affairs and Advancement at Indiana University Kokomo. In that role, she provided leadership for the fundraising, alumni relations, marketing and government relations departments. Penny's fundraising career began at Tipton Hospital, as the Director of the Tipton Hospital Foundation. Prior to that role, Penny spent 13 years as the 4-H Extension Educator with the Purdue Cooperative Extension Service. She began her career working for Purina Mills as a specialty feed area manager. Penny received her Bachelor of Science degree in Agriculture from Purdue University, and later returned to Purdue to earn her Master of Science in Education. Penny has a son Robert, 26, and two daughters, Sydney, 24, and Olivia, 22. Denny Sponsel, or the "Big Kahuna" as he is more commonly known to RJE employees, is the CEO and Owner of RJE Business Interiors. While he may have spent the last 40 years improving workplace design throughout the Midwest, his true passion lies in proving RJE's clients with the best possible customer experience. A hugger at his core, Denny extends his favorite mantra - Do What We Say We Will Do - to all his philanthropic efforts as well. Outside of RJE, Denny has spent his life dedicated to bettering Indianapolis. Throughout the course of his career, he has sat on the board for multiple organizations including: United Way of Central Indiana, Indiana Historical Society, Downtown Indy, Inc., Rotary Club of Indianapolis, Girl Scouts of Central Indiana, and Marian University. The Kindelsperger Forum is a leadership presentation honoring the contributions of Kris W. Kindelsperger, the former Senior Executive Consultant at Johnson, Grossnickle and Associates, to the Central Indiana nonprofit community. 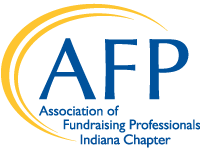 The Kindelsperger Forum is an annual program of the AFP Central Indiana Chapter which will bring thought leaders in fundraising and philanthropy to Indianapolis to discuss strategic issues impacting the profession in honor of Kris W. Kindelsperger. Kindelsperger was a valued and influential advancement professional who helped hundreds of nonprofit organizations make a lasting impact through his nearly 35 years of service to the community. Kris served as a valued and influential advancement professional for more than 20 years before joining Johnson, Grossnickle and Associates as a Senior Consultant in 2000. Over the next 14 years, he worked with hundreds of organizations and made a significant and lasting impact on the lives of client staff, volunteers, and those they served. For his colleagues at JGA, Kris was a quiet and reflective advisor, a welcoming and friendly voice in deliberations, a persistently hopeful and inspiring example, and a gentle spirit that made everyone believe in the possibilities of our common work together.